Easy Valentine Craft Ideas for Kids...Show Love with Homemade Valentines! 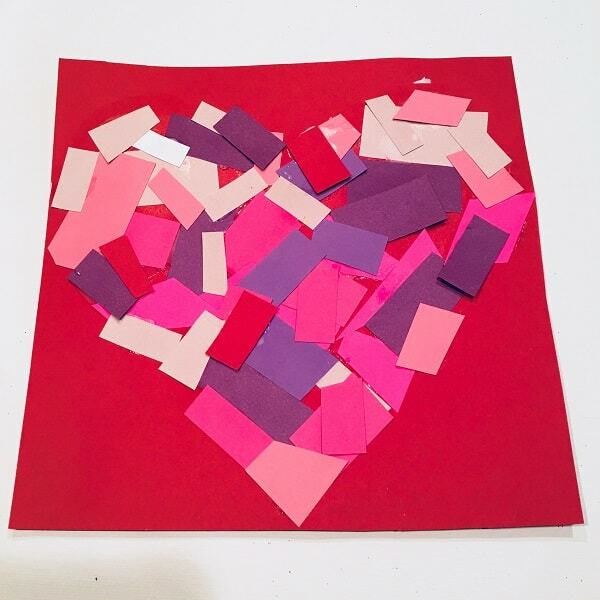 Like most kids, mine absolutely loves creating crafts for family and friends…Valentine’s Day is no different. Valentine’s Day provides such a fun opportunity to show love and appreciation for the special people in your life. From simple, homemade Valentines crafts to Valentine boxes & treats, we love Valentine’s Day. If you’re looking for fun & easy valentines themed craft ideas, we’ve got three great projects for you. Need ideas for things to do on Valentine’s Day with your kiddos? We got that covered too. Take a look at some fun Valentine’s Day activities for families in KC. Valentine’s Day is one of my favorite holidays! I love everything about showing others how much I care. Now that my daughter is 3 and into art and crafts, I am beyond excited to create some fun and loveable holiday crafts with her! I found pieces of unused scrapbook, computer and construction paper to find the mix of colors and then got creative to add tissue paper and different embellishments. We chose to use red as our background color for our heart. I used an old calendar for a heavy-duty paper to cut out my heart. I did the old trick where I folded it in half so the sides matched. You will be using the outside of the cutout, not the actual heart. I only taped around the sides so the white paper could easily come off when we were done. I cut all the little pieces of scrap paper for my daughter to glue. She personally separated them all into little piles to keep her colors organized. It is up to you if you want to use white glue or stick glue. From there I set her free to glue, stick, smudge, create and pile on all the “pieces”. When she was all done I cut around the white square and slowly peeled off the heart cut out. This would make a great gift for grandparents with the added words “I (we) Love You To Pieces” and the grandparents will adore the sweet valentines crafts. This Valentines project was a tag team from both of us which made for some messy and fun memories. I started off by taping “L O V E” on the large white paper. We used a large 12 x 12 paper which I will eventually trim down to frame this project. The letters were all easy to tape, except for the “O”, as you can see that took a little more effort. My daughter had no interest in painting on the white paper but wanted to use the acrylic paint on some scrap paper laying near. Your children can paint whatever they would like on the paper using different Valentines colors and textures. Let it dry…then add a few more layers of paint. For younger kids you could also use water-color paints. After the art project has dried for a few hours, carefully peel the masking tape off. Now you have a finished, Valentines masterpiece. You can set it out for all future Valentine Days! This project is perfect for the kids who love stickers! There really isn’t any set way to do this project…just let your imagination flow. I cut out the initial hearts to make the fish’s body and showed my daughter how to line up the hearts as scales. I found these heart stickers and heart cutouts at craft store in the Valentine’s section. You can also check out the Dollar Store or Dollar Tree for Valentines Day craft supplies of all kinds. We used glue to stick the construction paper together and the heart cut outs. She added the heart stickers where she felt necessary. I absolutely loved how this turned out and she is very proud to have this one hung high on the refrigerator! Want to skip the mess? Head over to Kaleidoscope at Crown Center for one of their free family art sessions using leftover materials from Hallmark’s Manufacturing process where your kids can create their own masterpieces to take home! Every year, we look forward to coming up with ideas for how we can decorate a fun box for Valentine’s day cards at school. Here are some themes we’re throwing around our house this year for your own inspiration. Pro-Tip: Our friends at Taste Buds Kitchen in Leawood and at The Cooking Station in Lee’s Summit have great Valentine’s themed cooking workshops.